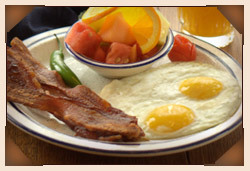 We also offer breakfast banquets! Served with a choice of Patch potatoes, potato cakes or fresh fruit. * Department of Public Health Notice: Meats or eggs that are undercooked to your specification may increase your risk of foodborne illness, especially if you have certain medical conditions. Please inform your server of any food allergies.